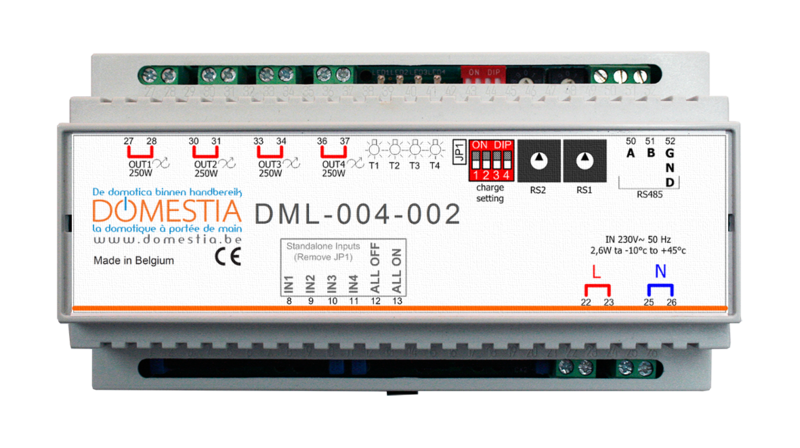 The “DML-004-002” module is a 4-output dimmer extension module (4x250W): it is connected to our Starter Kit or to our management unit via communication bus RS485. It can also be autonomous ("standalone" mode) and managed directly via a push-button including all on or all off functions. It can be used to vary the brightness of 4 light circuits of the following types: LEDs/dimmable energy-saving bulb/incandescent bulb/halogen 110-240 VAC (50-60Hz)/halogen 12V (via transformer adapted to the dimmer). Dimmer mode can be selected output by output as “leading edge” or “trailing edge”. When a push button is being pushed, the associated output will be dimmed. A brief press of the PB when the output is "on" will turn the latter off. A brief press on the PB when the output is "off" will turn the output on at the last brightness applied to this output. Number of outlets available: 4 outlets each with a maximum power of 250W. The outlets are protected against short-circuits and overheating. Selection of the output address via 2 address dials. "Trailing Edge" or "Leading Edge" dimmer (selection of the operating mode for each channel individually).